RedWolf Airsoft is celebrating this Christmas and New Year's with our customers by giving away thousands of dollars in free gifts! Make any purchase from November 24, 2005 through January 10th, 2006, and you'll automatically be entered into our raffle drawing for one of the valuable prizes below. 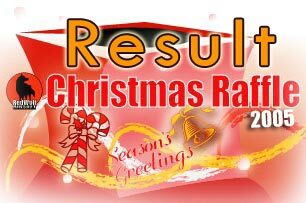 Congratulation on all the winners of X'mas raffle 2005, we will contact winners through e-mail individually. NOTE: Winners are responsible for shipping costs of these prizes. - Purchases must be paid for in full before January 10th to qualify to entry into raffle drawing. Pending unpaid orders do not count. - Each individual purchase qualifies for one entry, so the more purchases you make, the more chances of winning! - If a prize becomes unavailable at time of drawing, RedWolf reserves the right to replace the prize for something of equal value.